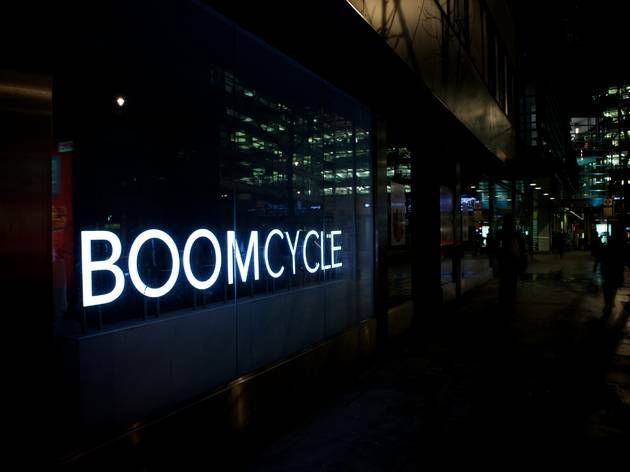 Fast-paced and fun spinning classes at BOOM Cycle's flagship Shoreditch studio combine the cycling craze with the kind of quality electronic music you'd expect to find in London clubs. The group cycling classes are sweaty, high energy affairs ideal for exercise junkies and fans of keep fit. BOOM Cycle is a boutique spinning-studio designed to encourage you, high-five you, make you sweat, support you, entertain you and inspire you through the power of music and immersive studio atmosphere. Everyone can be, and is part of, the BOOM Cycle experience. Come join the party. Boom only cycle and they do it well. The classes are motivating and include upper body movements, as well as a track using weights. You'll leave the class with a rush of endorphins. Make the most of the introductory offer, or use Boom Cycle as a break from your regular workout routine. I got addicted to Soul Cycle in America and this was one of the closest classes I could find. Excellent workout to a pumping playlist with top notch instructors that'll have you peddling until you can't peddle anymore. Worth checking out if you enjoy spin classes or want to mix it up from the stock standard gym based classes. Exciting choreography and upper body focused weighted movements to work every part of your body. Changing room was small. If you're serious about spin, this is the place to be. These classes are top notch with the most enthusiastic instructors I have come across. You completely forget that you're working out as the music is so loud that you can't hear your own breath. It's also lit like a nightclub so you don't even need to be drinking to be having the time of your life. The only draw back is the change rooms. They have very few dimly lit showers that turn off every 10 seconds so you have to keep pressing the button constantly to get running water. After you have waited for your shower, you then have to wait to do your makeup at the beauty bar which is again quite small. Their smoothies are delicious though and you can order them before your class if you're in a rush. 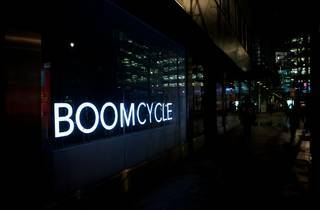 I like the premise of boom cycle - a loud nightclub style basement which actually is really a spin studio. Classes with good music and good instructors, it's in the pitch black and it's good in the sense that you don't care about sweating/looking awful because it's so dark you can't see the outline of your own hands. Classes haven't been massively full when I've been, and I think it's a little pricey, but there is a great intro offer to get you started with 3 classes for 20 quid, I think (if I remember correctly). My colleague and I joined for the 2 week trial at Boom cycle and I would highly recommend. 6 weeks in and we have both dropped a dress size easily without watching what we are eating and having so much fun doing so! Great music, great instructors and a timetable to fit around our busy lives. - not to mention great customer service from Hilary and Rob.